Horse fights occur mainly in Mindano (south of Philippines). The horses, that usually don’t attack nor fight against each other, are brutally led to perform by presenting them a “bait” in the form of a menstruating mare, brought and tied in the arena, in order to drive crazy the two males that start then attacking the “sexual rival”. The result is a bloody battle, during which the animals bite and kick each other, causing serious damages. Horses die of wounds, from blows and might also die from exhaustion. Usually, even those who survive the fight are sacrificed as owners do not wish to spend money in veterinary cares. The experience for the mare is equally traumatising, as she suffers the blows from the fighting males and is also forced to mate with the winners. Although officially those fights are illegal, corruption and lack of effective control allow this cruelty to continue to happen and even to broadcast some of the “matches” on TV. 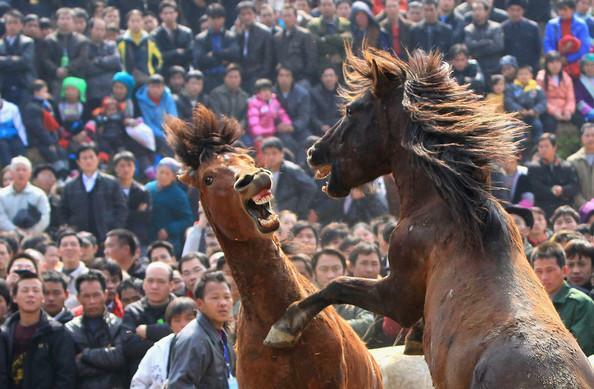 In addition to Philippines, horse fights are also organized in some areas of Indonesia, South Korea and China. Pig fights are just as much cruel: they are mainly organized in the Chinese region of Guangxi Zhuang, where a festival dedicated to this “tradition” takes place (in Luizhou). Those barbaric performances are “celebrated” in stadiums in front of thousands of screaming people. Those animals are also forced to fight by their “trainers”, who hit and poke them with sharp sticks. Animals crash and bang their heads into each other’s and bite their forced rivals’ neck. A fight ends only when one or both animals die. In the same region, water buffalos are also used to fight until death. As stated before, even if those performances are terribly violent and cruel, their responsible keep claiming that they are “traditional” and state that they will not stop organising them as they represent an important part of the local culture.